Hey guys! Soooo I wanted to take the time and tell you about my visit to Crumbs and Whiskers. 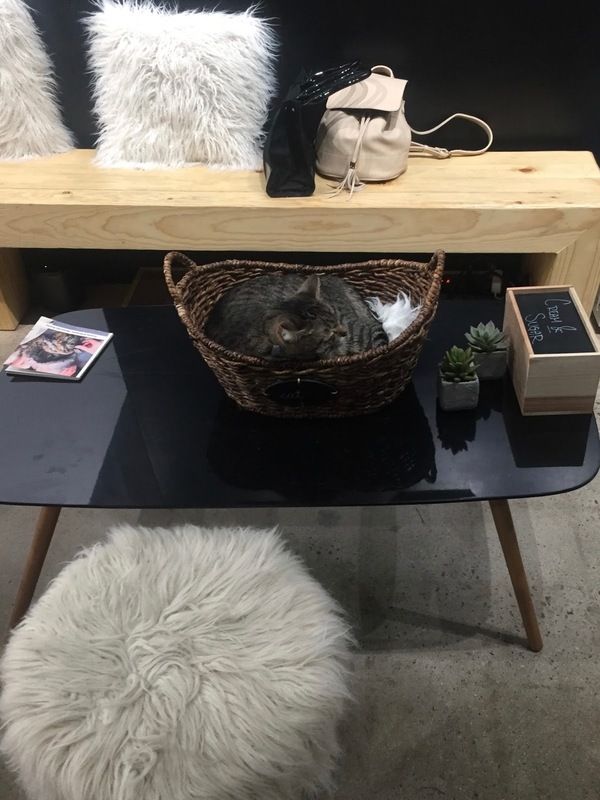 Crumbs and Whiskers in essence a cat adoption center/coffee shop, HOW GREAT IS THAT?!?!? So a little background about what they do: they rescue cats from shelters in order to avoid them getting put down. To learn more click here. I was absolutely in love with the idea. I am a HUGE animal lover and unfortunately can't have animals where I live, and it just wouldn't be fair for an animal because I'm not home a lot of the time. So when I heard about Crumbs and Whiskers I was so excited to go. It's always nice to go with the intention of adopting BUT if you're like me and just want to go play with cats while drinking coffee or tea, then I suggest you make your reservation. Reservations are required because of the amount of traffic they get. There is a fee of 22 dollars but it is totally worth it, not only are you going to have a good time petting these adorable cats but you're also helping save these cats lives.